Board indexGeneral"I'm new to offroadtb.com!" New members: please introduce yourself here. Hello alll! 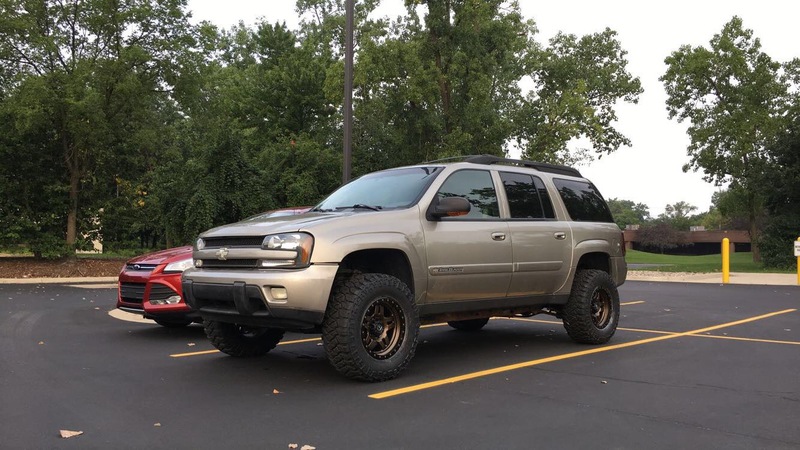 I got my trailblazer a few months ago and I'm looking to get a 3"in lift + new struts and shocks. Any suggestions? One thing you will learn very quickly on this forum. You’re expected to use the search bar to find info first. If you don’t your stay here will be unpleasant. There are a couple of sheets about lifts, tire sizes already. Sorry if I came off rude, I just wanted to forewarn you. Other than that, welcome to the forum, always glad to have more members. Hopefully you’ll be an active member. If you use the search bar before asking, your stay here will be awesome. The generally suggestion for lifts is to go the route of liftmiester, I went the cheapo high schooler route, others will be more knowledgeable about liftmiester. Ok thanks I will look into that. Fellow Montuckian here. There are lots of posts to read on the forums here before you make a decision on what to buy based on your intended purpose for you GMT360. I would recommend spending a minimum of 2-3 weeks reviewing posts and taking notes. Then if you still have questions or need clarification post in the appropriate section. Provide as much information as you can. Be somewhat patient and you'll get answers. What part of Montana are you in? If you are close to Great Falls, I can certainly give you a look at my vehicle that's in storage and give you a few ideas or answer a few questions directly. If you know for sure that you want to lift it go with MarkMC for all of your lift and spacer needs. I got my lift and adaptors from him. He does great work. I run his 3 inch lift and I've had it for around 8 months. As for struts and shocks, I plan on buying Bilsteins all around once I have time. My brothers have always gotten Bilstein shocks and they feel really good, and I have heard good things about them on the forums. My only complaint is that I didn't replace the struts while I was installing the lift. Now I have to tear it all apart again when I decide to do it. wstuckey1 wrote: If you know for sure that you want to lift it go with MarkMC for all of your lift and spacer needs. I got my lift and adaptors from him. He does great work. I run his 3 inch lift and I've had it for around 8 months. Yeah I'm definitely getting some sort of lift. I emailed Marc he says he doesn't sell the lifts anymore unfortunately. I'll have to look somewhere else. Im down south in Bozeman. I'm open to any ideas, I'm still trying to figure out where to get a good lift. I contacted Marc and he said he doesn't sell the lift anymore. There is one on Amazon I was looking at but I don't know if it's any good. What model on amazon? Bilstein makes a new adjustable strut for our vehicle so you won’t need a front lift. What's the name of the strut? Return to "I'm new to offroadtb.com!"